Matt Gallant with John Witherspoon, President of Skowhegan Savings Bank. FARMINGTON - A junior at Mt. Blue High School recently won a prestigious business competition after presenting his plan to Skowhegan Savings Bank representatives. 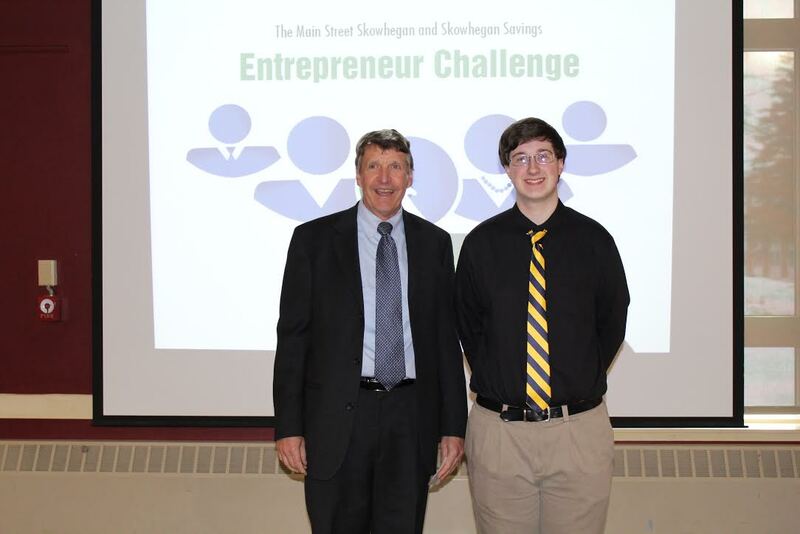 Matthew Gallant, a junior at MBHS, was selected as the winner of the Junior Entrepreneur Challenge for his efforts with Gallant Media. The challenge awards prizes to the top adult entrepreneur, as well as the top three junior entrepreneurs in the area. Developed by Main Street Skowhegan’s Business Enhancement Committee and sponsored by Skowhegan Savings Bank, the Entrepreneur Challenge is designed to strengthen Skowhegan’s economy and spur business development in the region. “I’ve been interested in business ever since middle school. I really like the idea of providing services to people,” Gallant said. Gallant plans to use his first-place prize money of $1,000- awarded via a grant from Skowhegan Savings Bank—to fund his start-up. Gallant Media will provide affordable website and app design to community members- a resource that Gallant sees as invaluable to the region. “My philosophy is that low cost computer services can help boost local economy,” he said. Both competitions included educational components that provided entrepreneurs with information about the nuts and bolts of owning a business. Junior entrepreneurs took entrepreneurship classes and met with local business leaders. Participants in the Main Street Skowhegan Savings Entrepreneur Challenge attended business seminars where they learned about insurance needs, required permits, cash flow and financial analyses, and marketing strategies. Gallant also participates in the Foster Educational and Technology Center Entrepreneur class, where he has been building the idea for Gallant Media. In addition, Gallant has been developing an app for FETC to help track internships for students. “For Matt there is nothing he can’t do. He’s extremely focused and applies himself so well. He’s like a sponge, which is a key characteristic for an entrepreneur,” Entrepreneur class instructor Bonita Lehigh said. For more information contact Matt Gallant at matt@gallantmedia.us.